Posted on February 25, 2014 by Derry O Donnell Posted in Community, Job Creation, News	. Friday night, 21st Feb., I popped along to an event organised by the Tipperary Environmental Network in LiT Thurles. The event ‘Co-ops – The saving of a community’ involved presentations by three speakers followed by a discussion and Q and A session. The speakers were Bill Kelly of Meitheal Mid West and the Limerick Community Grocery Co-operative, Marcella Maher Keogh of the Drombane Upperchurch Energy Team and Mary Fogarty from The Cottage Loughmore. Bill Kelly was first up to speak about Meitheal Mid West and the Limerick Community Grocery Co-operative. Meitheal Mid West was established in 2012 when an initial group of 19 got together. It was Ireland’s first Multi-Stakeholder Co-operative, which means it is a business that is owned and democratically controlled by multiple stakeholders which can include workers, consumers, producers, and/or community members. The community grocery started out as a buying club but is expanding it’s services as it grows. In order to learn more about successful co-ops they visited the hugely successful Mondragón Cooperative Corporation in the Spanish Basque country which employs over 80,000 people and has an annual turnover of €14 Billion. The co-op model is the default model for any new businesses setting up in the region, even schools are established as co-ops. The group also visited the Park Slope Food Co-op in New York which is open 7 days a week, has over 16,500 members and has an annual turnover of $48 million. Members volunteer for 4 hours work per month. They could be shopping today and packing shelves tomorrow. They employ 70 full time staff who earn $56000 per annum (7 staff are on higher salaries of $70k due to extra work and responsibilities). There is a waiting list to become a member of Park Slope Co-op. You can read more about it in this BBC report. The Limerick based co-op now has 108 members (as of 21/02/14) with an average of 5 new members joining up each week. Their mantra is ‘wholesome food at affordable prices’. Bill is keen to emphasise the importance of looking after your suppliers in a co-op. He also spoke a bit about safeguarding the assets of a co-op from predatory exploitative elements and to ensure a legal structure is in place to prevent takeovers and buyouts. This would mean having a strict form of co-op that would protect the ethos of it’s members. Bill told us that in the future they will be exploring crowdfunding to assist in their plans for expansion. This will possibly be in the form of loans from members of the community who would rather see their money put to use and benefiting the local community than just simply sitting in a bank account earning a low rate of interest. Peer to peer financing has seen considerable growth over the past while. Irish company LinkedFinance.com has assisted several viable businesses obtain loans from members of the public who offer the amount they are willing to lend and what interest rate they would like. In true co-operative spirit Bill told us he was travelling to Dublin the following day to visit Dublin Food Co-op to share ideas and learn from each other. 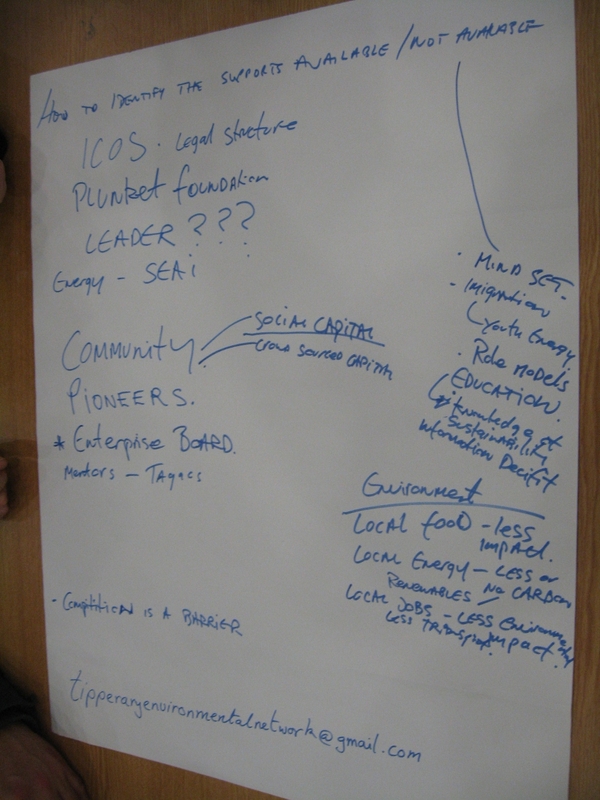 As is evident in the UK where co-ops are far more plentiful, there is a willingness to share information and knowledge. A pleasant change from the corporate diet of ‘dog eat dog’ we have all been fed. This video helps explain more about workers co-operatives. 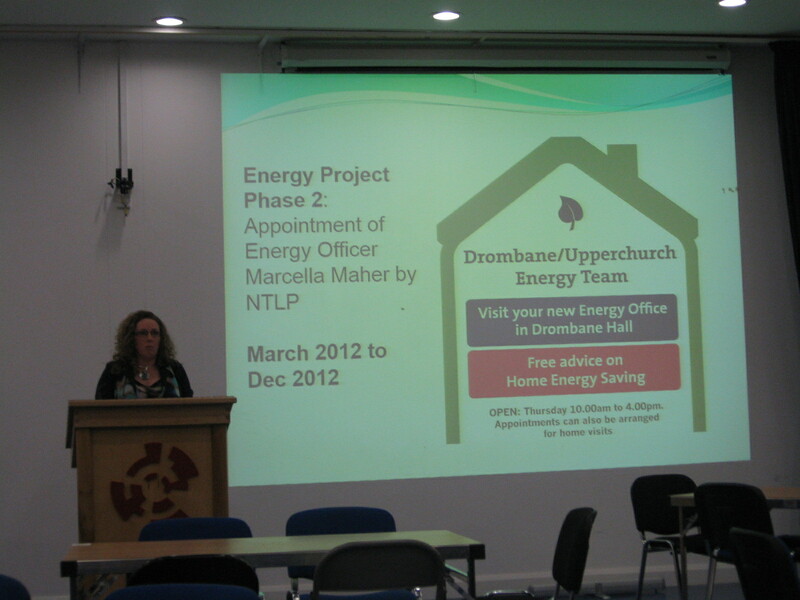 The next speaker was Marcella Maher Keogh from the Drombane Upperchurch Energy Team (DUET), Co. Tipperary. Earlier this year DUET won an award for Best Community Renewable Energy Project at the Community and Council Awards. 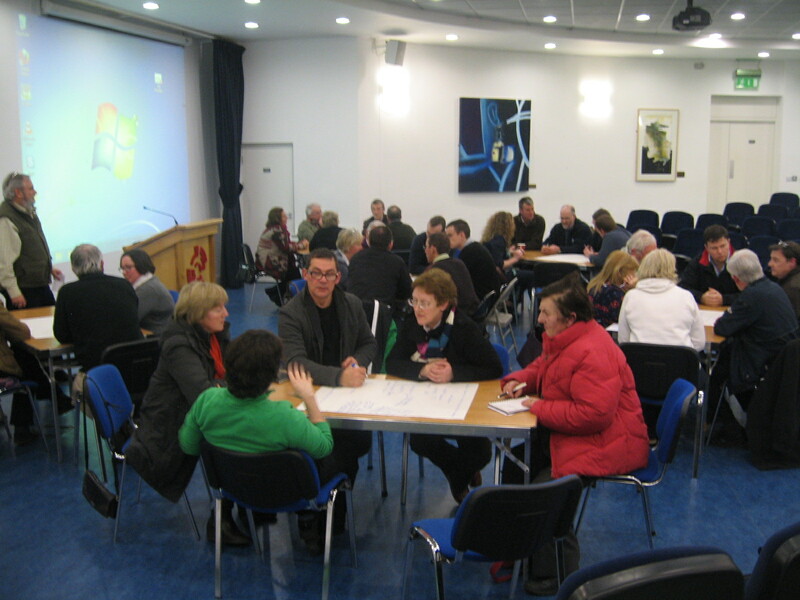 Members of the Drombane-Upperchurch village group in Tipperary got together in 2011 to discuss economic solutions for their community. They considered many ideas, from wind farms to a local ski slope. After several meetings with Tipperary Energy Agency and North Tipperary Leader Partnership, they settled on a community housing retrofit scheme. The aim of the scheme was to convert many of the houses in the locality to high energy preforming homes. This would result in warmer homes, lower fuel bills, and the creation of local jobs. A survey was carried out which found that in total, the 400 houses in the Drombane and Upperchurch locality spend €1,000,000 on home energy each year. This equates to €1000 per person or €2,500 per household. A 25% reduction in home energy expenses would save €250,000. Around the same time the DUET group was meeting up, SEAI introduced the Better Energy Communities Scheme. This enabled the group to proceed with their plans. In 2012, in a 4 week period, 22 houses were retrofitted at a total cost of €115,000, which was grant aided by SEAI to the total of €88,000. Most of the insulation work carried out involved attic insulation and pumped cavity walls. In 2013 another 28 houses and 2 community buildings were completed. The total cost so far has been €403,000 which includes grant aid from SEAI of €301,000. A loan was also received from Clann Credo who provide social finance for community growth. You can download a case study of the project from the DUET Facebook page. The success seen in Drombane and Upperchurch has encouraged other projects to get started in Co. Tipperary and the setting up of other Community Energy initiatives driven by North Tipperary LEADER Partnership. Drombane Upperchurch Energy Team were featured on a recent edition of EcoEye. See full video below (the DUET story is just after minute 17) . My other neighbours in Templederry also feature in the video for their Community Wind Farm project. So just watch the full thing, ok .
Mary Fogarty from The Cottage in Loughmore, Co. Tipperary was the last speaker. The Cottage is a community based shop and tea rooms. Mary and her colleague Maeve O Heir had similar ideas and a shared vision to try and do something for their village. There was no grocery shop in the village so they decided to open one based on a community ownership model. Maeve’s sister provided the use of an old cottage for the purpose. To finance the operation they approached North Tipp Leader (NTLP). A feasibility study was carried out to check it’s viability. They also met the CEO of the Plunkett Foundation who was visiting Ireland. The Plunkett Foundation, founded by Irishman Horace Plunkett, is a UK based organisation who provide advice and assistance to hundreds of co-operative community owned shops, pubs and other enterprises in the UK. He invited them over to the UK where they visited a number of community shops, of which there are over 300. They gained valuable advice and insights from their visit. To set up legally as a co-op they engaged the services of the Irish Co-operative Organisation Society (ICOS). Two thirds of the parish came to a meeting the women organised. People were invited to become producers and craftspeople. They now have 9 of each supplying the shop coming from within a 5 mile radius. Community shares were sold at €10 each to parishioners, meaning that the community actually owns the business. 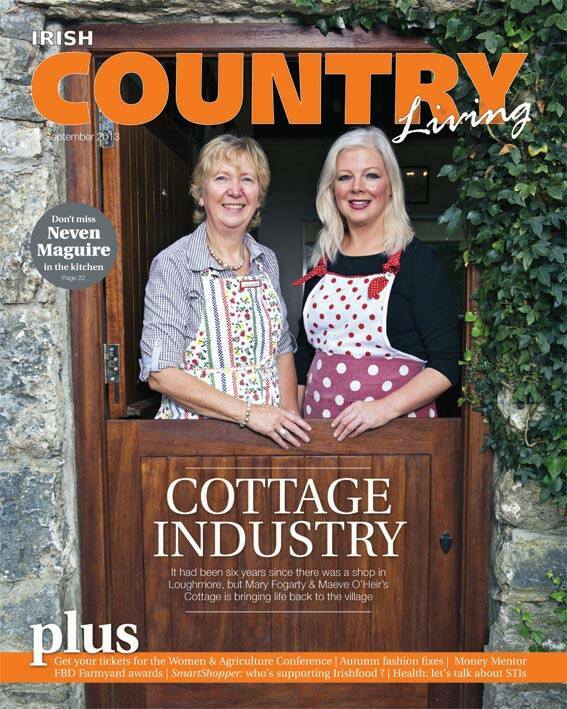 Currently 25 local people benefit financially each month from The Cottage. There are 3 full time employees, 12 volunteers and 2 Tús scheme participants. The Cottage has won 2 CAVA Awards (Community and Voluntary Association). They’ve appeared on RTE’s Nationwide programme and have been invited to attend various events from the National Ploughing Championships to Electric Picnic and have featured in countless newspaper and magazine reports. You can keep up to date with their news via their Facebook page. It was then time for tea. And biscuits. And scones. And cake. After the break Davie Philips of cultivate.ie gave a quick mention to the Get Involved project which is a local community initiative developed by NNI Local & Regional and the Regional Newspapers and Printers Association of Ireland (RNPAI). The Get Involved project encourages the sharing of ideas and collaboration and has the potential to generate livelihoods, resiliency and neighbourliness. Watch out for ads in local papers in March. Attendees were then invited to break into groups and work on answering some questions that were written on large sheets of paper at various tables. A spokesperson from each group then delivered their findings. Education – knowledge of sustainability information deficit. Lack of education was one of the things that popped up in a few of the group presentations. As it so happens, members of North Tipperary Economic Working Group are hosting some events in March to get the views of people and some input into the County training and education plan. Hopefully more training and education on setting up co-operatives and community based schemes will be added to the list of courses run by the various state agencies. Some workshops on collaboration and group problem solving would also prove beneficial and would help foster greater community participation in resolving some of the issues we are faced with today. I remain hopeful for the future. Tags: Co-operative, Co-ops, Community, Drombane Upperchurch Energy Team, ICOS, Leader Programme, Limerick Community Grocery, Meitheal Mid West, NTLP, Plunkett Foundation, SEAI, The Cottage Loughmore	.